Use our unique resources to structure and fortify ourselves as a stable and consistent provider. Mitigate risk and uncertainty for our partners when bringing new products to market. Our Anderson Fittings leadership team believes the best way to fortify our ability to partner is to be business-unit focused, keeping growth in the forefront of our model. 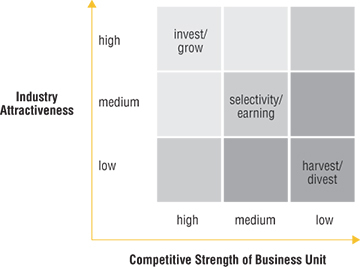 We use a strategic matrix to gauge the attractiveness of a relevant industry and then measure our unit’s competitive strength within that industry. This decision-making process allows us to acquire, divest and selectively invest in capabilities and resources to best serve you, and we will continue to do so. We listen…then we listen some more. We ask probing, thought-provoking questions about your market, industry and application. We try to quantify “pain points” so we can create total value for you expressed through a realized ROI. We confirm our analysis to ensure accuracy in our assessments and calculations. We do this by engaging with your organization’s key people who may have varying perspectives and differing concerns. Capturing different perspectives helps us develop more comprehensive solutions for you. Crystallizing a buying vision to focus on your best result for profitability and growth. The management of new products is really the management of risk. So who you partner with becomes vitally important to the return on your investment in your new product. 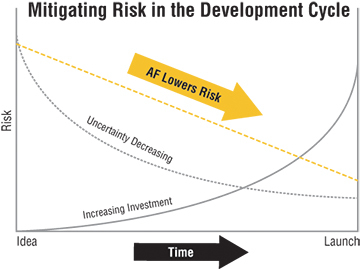 At the beginning of a project, the amounts at stake (e.g., time, resources, and costs) are usually low, while the uncertainty of the outcome is very high. As the project progresses the amounts at stake increase. If risk is to be managed successfully, the uncertainties of outcomes must be deliberately driven down as the stakes increase. Uncertainty and amounts at stake must be kept in balance. This is what we do. As your product development partner, we are tasked with managing the inherent risks by reducing the uncertainties to help realize your investment at the time of launch. We encourage you to learn more about our Product Development & Innovation process or call us at 1-800-323-5284.